After our first 4 integrations (Sprint.ly, GitHub, FogBugz and Asana), we finally managed to integrate Trello. 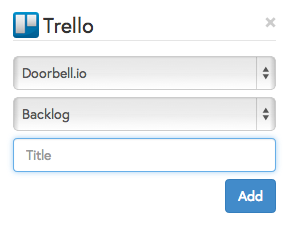 Which is a great thing, since we use Trello ourselves to organize Doorbell! Setting up the Trello integration is dead simple, and only requires about 2 clicks. Head over to your integrations page, and click the “Connect Trello” button. It will redirect you to Trello, when you need to authorize Doorbell to access your boards. Once that’s done, you can start sending your user feedback to your boards!